Chad Dickerson, CEO of Etsy, spoke at the RSA about placing people and planet at the center of the business. He speaks to the shift in mindset that's occurring due to the information revolution, he quotes E.F. Schumacher, "The way in which we experience and interpret the world obviously depends very much indeed on the kind of ideas that fill our minds.If they are mainly small, weak, superficial, and incoherent, life will appear insipid, uninteresting, petty, and chaotic." The internet allows us to read anyone's ideas from anywhere in the world. These ideas include the stories of people's living and working conditions. We empathize with these stories and we feel our interdependence. We've realized the harm human commercial activity has caused around the world. Dickerson argues for building a better mindset in order to build a more human world, specifically from "the conscious utilisation of our enormous technological and scientific potential for the fight against misery and human degradation – a fight in intimate contact with actual people, with individuals, families, small groups, rather than states and other anonymous abstractions" (E.F. Schumacher). I think he means leveraging our new mindset, due to new technologies, to place human work-life activities at the center of business. The examples he provides are about leveraging technologies like the internet and new corporate structures like the B-corp to create an inclusive, socially aware, and sustainable society. This shift in mindset should improve the quality of life while also creating sustainable businesses. In a meeting a while ago, we were describing our company's early adopters. I realized this should have been an exercise performed earlier when we first began developing our product. From the design perspective, I'll create user profiles of the end user, but sometimes this does not capture the early adopter. 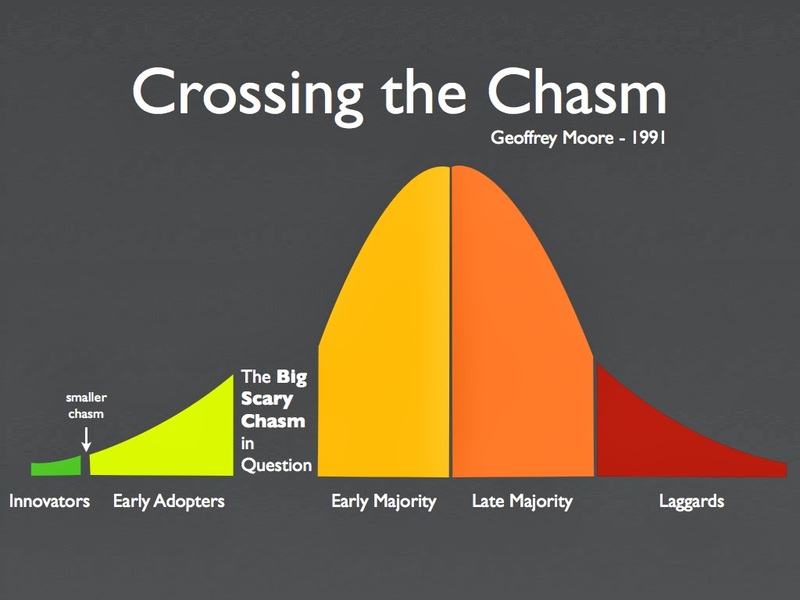 The terminology 'early adopter' communicates a go to market strategy. And so far in my short experience in the startup world, the way I've noticed entrepreneurs describing target audience is usually too broad, and it doesn't convey how they're going to reach these first few users or customers - the innovators. Crossing the Chasm by Geoffrey Moore comes to mind, where it discusses early adopters. Moore places innovators, early adopters, early majority, late majority, and laggards in a sequence of groups over the course of the business's lifetime. As a designer, I think doing user profiles is not enough. We should also be doing profiles of each of these user groups. The reason is because the scenarios describing how, when, and why they'll use a product changes based each group. The purpose of profiling each of these user groups is to generate business insights from a design perspective. Where Can Technology Take Us? You'll have to click read more to begin playing. I was in New York City a week ago. 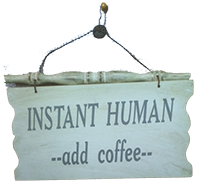 Before I went into work, I was waiting in line to order a coffee at Starbucks. Finally arriving at the front of the line I walk up to the register, but a man with a Middle Eastern accent jumps in front of everyone and shoves a hundred dollar bill in the cashier's face. He demands three espressos. Without going into detail about the confused and frustrated look on my face, while I walked to work I compared Middle Eastern and American culture. I was curious about their cultural approaches when it comes to reserving a table at a restaurant and ordering what you want at a market (in this case, a coffee shop). Edward Hall in his book the Hidden Dimension observes we don't notice our own cultural norms until we come up against another culture with a different set of tacit rules. Having come up against a Middle Eastern interaction, I asked myself, what does the line represent in American culture? I think the answer to this question goes back to 1776 - standing in line means that everyone is created equal. It's a utilitarian solution to ensure everyone's needs and wants are of equal value. The Middle Eastern man trying to order his espressos must have felt just as frustrated as me, trying to figure out why he couldn't order his espresso. My Iranian father occasionally expressed these frustrations at restaurants when he wasn't served immediately. Growing up, I had a difficult time understanding why he wouldn't make a reservation ahead of time. Instead, he would make a scene after hearing there's a two hour wait time when he arrived at the restaurant. Now that I'm 3000 miles away from where I grew up, Los Angeles, I feel like I have a new understanding for this part of Middle Eastern and American culture. What do other people think, what does the line represent? I was graciously invited by a friend to speak to her design students about the most important thing I learned while studying design: the design process. All other tools I've learned in my short design career have been to support solving problems. The following slides and pictures show a story about how I communicated the design process to freshman and sophomore design students at Parsons. During the presentation, I gave two examples of previous work experience, describing how I've understood the design process fitting within the work environment. I ended with a short design scenario, asking the students to identify the design problem and propose how they might go about researching, prototyping, and testing a solution to the design problem. I finally had a chance to write a math tool for TuvaLabs to visualize volume. You can see it live at this link, and it's also below. If you have any feedback or thoughts about other math tools that I should make, please leave a comment about it. I was playing around with processing and the minim library without any goal in mind. The end result was a trippy audio visualizer that might work really well at dance clubs. Anyone know any DJs that might be interested? I've set the visualizer to one song by Sufjan Stevens and another by Radiohead, so you can get a feel for how it responds to music. The code is waiting for microphone input and then turns the spectrum of sound into beautifully symmetric rotating and spinning circles. I've uploaded the code to github in case anyone is interested in playing with it. A great watch, if you have the time. What's particularly interesting is the discussion of competitive advantage around creating a system that aggregates openly available data. The advantage comes from creating a space for discussions to occur within your system, these discussions become privately held data. Then, these discussions can't be replicated by a competitor as easily, which keeps people coming back to your system. I recently used the YouTube Data API in Processing for an art project. The playlist below is the result of creating a physical booth people can enter, which then automatically uploads to YouTube. I've outlined the necessary steps to make the YouTube Data API work in Processing 2.0b5 or 2.0b6 in Windows 7 64 bit. 1. Create a YouTube Developer Account. 2. Create a developer key specific to your project. You can do so here. 3. Download the YouTube API jars. You can down the jars at my github repo for this project. 4. Check out the processing files demonstrating how youtube data api connects and uploads videos automagically. 5. Post questions in the comment section if you have any. The code below is the part that's uploading the video. You'll notice I'm extending the thread class because I wanted the Youtube video to upload on its own without running in the main draw thread. Art buys people - what does it mean and is it possible? It's just three words, but the word that bothers me the most, and I feel requires the most explication is 'buys.' 'Buys' implies an exchange of ownership. The usual way to buy something is done through money, or if we go way back in time, bartering is another way to exchange ownership of something. Since 'art' doesn't seem to be paying for people using money, there must be some sort of bartering going on between art and another entity for ownership of people. When an exchange of ownership occurs, it's usually an exchange between two or more parties. To keep it simple, let's stick with an exchange between two parties. This means art is exchanging something with another party for ownership of people. Or in other words, art is bartering for people. This now leads me to four questions. First, what is being exchanged? Second, who or what is art bartering with in order to own people? Third, where is the exchange occurring? And fourth, how long does art own people? I think these four questions are too tightly coupled to address one without answering the others. So I'll try my best to provide uncoupled answers - consider it a rough draft. Answering these questions will show that art can indeed buy people, in some sense of the phrase. If we look at the spaces where art exists: museums, sidewalks, our bodies, the internet... etc. I think they all fall on a spectrum between purely private and purely public spaces. I think the length of time one party can own something is dependent on where it's located. For example, graffiti on a sidewalk may last for a few hours to years, at least until someone deems it inappropriate and paints it over. A museum owns a piece from months to decades, and then it's traded, auctioned, or placed in storage. A tattoo can be owned for a lifetime. From these examples, I'm inferring that ownership is temporally based on the space it's located in. So far, I've shown ownership is temporal and dependent on the space it's in. Next, who or what is art bartering with in order to own people? In order to answer this question, we have to look at the different parties that exist in a space. I'm also assuming that not all people can be owned by art. This means, each spaces contains art, people, the unownable people, and the space itself. The simplest answer seems to be that art is bartering with the unownables in order to own people. An example of this in our world is selling another person into slavery. Another possible answer is that art is bartering with the space in order to own people. And the final one is art is exchanging something with people to own them. This last one is an individual selling themselves, like a job or even indentured servitude. We now come to the final question, what is being exchanged? And with slightly more words: what is art exchanging with people, the unownables, and the space in order to own people in these various spaces? The answer to this question seems varied because it will depend on the parties involved in the exchange. Specifically, the exchange between art and the space, between art and the unownables, and between art and people will probably influence what is being exchanged. If art is bartering with the unownables to own people, one possible example could be a museum curator purchasing art in order to own people for a brief amount of time - this is when museum goers go to view art pieces. Or in other words: the unownables buy art to buy people. This particular line of thinking also reminds me of advertisements... if advertisements can be considered an art, then there are unownables making advertisements in order to own people. The next one is art bartering with people to own people. This means people are exchanging themselves with art. An example of this kind of exchange in the real world is an individual selling themselves into slavery or indentured servitude to help their family. An example of this in the art world could be interactive art, where the person somehow engages with the art, therefore giving themselves up to be used by the art piece. The last type of exchange is between art and the space. This one I'm having a difficult time wrapping my mind around. The question is, what is art exchanging with the space in order to own people? If a space has some perceived value - for example, public spaces, private spaces, or some blend of the two - then it has something to exchange with the art. This perspective on spaces and art, two parties that are traditionally regarded as inanimate (lacking a will to take actions, make decisions, or do not have needs or wants) become much more alive. It seems that public spaces need people to do things that can only be done in public, otherwise the space is no longer public, and the public space will cease to exist - the public space's life is on the line. So having art in a public space means that art is exchanging something with the public space in order to attract people to that space. It is possible that there is no exchange going on between art and the space, and instead, they have a symbiotic relationship. They work together to continue existing. Now to answer our original question: "art buys people" - what does it mean and is it possible? I still don't feel I have a grasp of what it means, but it might be possible, at least arguments can be made to make it seem possible. This brief explication of 'art buys people' still leaves many unanswered questions. What is art doing with the people it owns? What is the artist's role and responsibility, if her art is capable of owning people? What does art want or need? And is this absurd? As an analytic philosopher, I greatly appreciate this talk about argumentation because it communicates how our culture's norms have shifted towards the popular and worthless view of arguments. His rich definition of argumentation goes beyond the lay stereotype of screaming to make a point. I agree with Daniel Cohen's perspective that arguing is a form of learning - it's the loser of the argument that actually gains new knowledge, so the winner doesn't really gain anything from winning an argument. Watch the talk to learn more. It's been a while since I've posted any updates. I've been super busy working with TuvaLabs over the past ten months, finishing my thesis, and now working with GoodCompany Group to implement my thesis work to develop an entrepreneurial mentoring program with them. Some great news: I'm a Corzo Grant recepient. Read more about it here and here. I'm sharing this TED talk because of the last few sentences spoken by Lisa Bu. To paraphrase, she says that the purpose of aspirational dreams, whether they come true or not, are to reveal what makes us happy and to help us find the source of what can bring purpose to our lives. I find this thought provoking observation to contain some truth because it means people can analyze these dreams in order to understand why they aspire in certain directions. This type of aspiration based analysis should reveal our inner standards for happiness and purpose. The moment everyone's been waiting for, the final draft of my thesis is finally available through issuu. Check it out! Jay Silver: Hack a banana, make a keyboard! The following slideshare is my master's thesis defense. Even though there's 51 slides, the run time was roughly 12 minutes. After presenting the mentor system during my thesis defense, I received feedback on two major areas of the system that will help guide its development. The first area is learning for the entrepreneur and the second area is determining the outcome of the mentor system. One of the challenges of the mentor system is measuring the actual learning that is going on within the mentoring session. For the entrepreneur, the learning occurring during these mentoring sessions is dependent on their stage – idea stage, launch stage, or operating business stage. As part of the design for the mentor system, the system needs a set of metrics for measuring the appropriate skills for each of these stages. 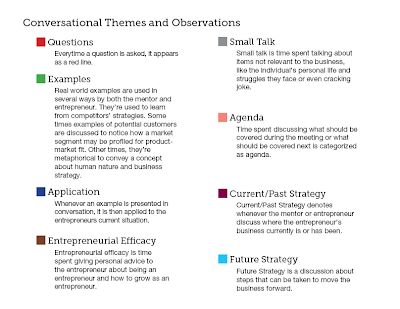 Measuring these basic competencies for each stage, while the entrepreneur has progressed from the idea stage to launch stage and finally to an operating business, will determine whether the learning will actually result in an increased business success. In other words, the entrepreneur will be making less mistakes. As a part of learning from a mentor and having discussions and feedback, the entrepreneur should make less mistakes over time. Being able to know when an entrepreneur changes their mind from going down one road to another can be one indicator of learning. Another indicator is measuring for the conversational themes. If these conversational themes were present within the mentoring conversation, then the precursor for learning is present. 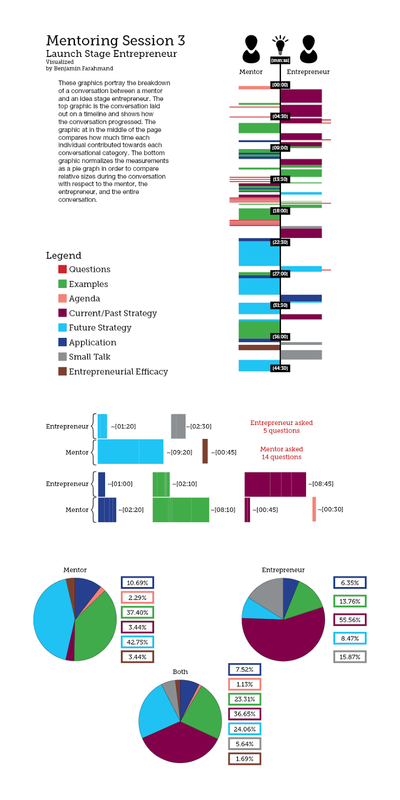 However, without measuring entrepreneurial behavior we can not be certain if learning took place. For example, if we look at a classroom full of math students, we can measure how they are learning by testing them against a set of standards. We begin with an entry exam, to see how much they know on the subject. The lesson is taught and a second exam is administered on the same subject. If fewer mistakes were made, it's assumed that learning has occurred during the lesson. I think this same example can be applied to entrepreneurship in the sense that learning is measured over time, not with a single set of questions. A reduction in mistakes can not be measured by a single exam. Obviously, asking entrepreneurs to take a single survey as they are starting their businesses is not the right way to go about measuring learning. Finding the appropriate mechanism for this will take some time and will guide the development of this project over the next few months. I think this feedback will effect the follow-up section of the mentor system by determining the questions that need to be asked. The second area of thesis committee feedback is determining the outcome of the mentor system. This means that I need to explicitly communicate the value this system delivers to its different audiences – entrepreneurs, mentors, and local mentoring organizations. This ties directly with the value proposition because it will determine the expectations of each audience before they use the mentor system. At the moment, it seems the best course of action is to go directly to the users in order to determine what the mentor system should accomplish. If we look at entrepreneurs, we realize they want a successful business. Non-profit local mentoring organizations want to help more entrepreneurs because they receive federal funding that requires them to help as many entrepreneurs that seek them out. Mentors want to be able to give back and see an eventual impact as a result of their mentoring. The needs and wants of these three different intersect at helping entrepreneurs start and continue to operate sustainable businesses. At this intersect, I believe we can define the outcome for the mentor system. A beautiful talk by Meg Jay about the importance of not wasting your 20s. The following publication recounts the experiences of my colleagues and myself while we were collaborating with Liberty Resources to design for disability. Mall Futures is a design project a few colleagues and I worked. Here's the publication. The Perspective of Human Centered Design: What is it? Human Centered Design has two premises. The first, individuals comprising a culture are the experts of their culture. The second, in order to design a solution for a culture’s problem, the designer is not the expert of the solution or the problem. A culture comprises all the rules and beliefs, tacit and explicit, governing interactions between individuals, thought and action processes, and value systems. An individual can be a part of several different cultures and cultures may also influence one another just as individuals influence one another. The implications of these two premises set the necessary conditions for a design process that removes the designer as the locus of action for solving and framing a problem. This means the designer acts as a communicator and investigator, discovering a culture’s problem through ethnographic research, interviews and surveys, and cultural probes. The information gathered is synthesized, analyzed, and summarized to be communicated back to the individuals of a culture so these individuals may validate or invalidate how the culture is framing its own problem. This means the human centered designer is also a facilitator, allowing the culture to use the designer as a means to solving their own problem. Design vs Business: What Value Does Design Add to Business? Jer Thorp argues for placing data into a human context. A great talk by Dan Pink presenting a few findings regarding sales and how salespeople persuade others. He also presents data to counter some widely held beliefs about extroverts being the best salespeople. A great Ted Talk about the stigmas of non-profits that are hindering their scalable impact. Dan Pallotta is a social entrepreneur that is changing how we think about the way non-profits are perceived by the public. A great talk about beliefs, the nature of being wrong, and how people feel when they discover they're wrong or have yet to learn that they're wrong. One of the most compelling talks I've seen all year. Allen Savory presents a natural solution to reducing the amount of carbon dioxide in the atmosphere. He's tested this method on over 15,000,000 hectares of land. He's been turning desert into productive vegetative land simply by using domesticated herds to mimic natural herd behavior in a predator and prey environment. Now that I've almost completed my Master's in Industrial Design, I've been struggling with how to communicate what I do to people that confuse different disciplines of design with each other. Part of what gives rise to this confusion is figuring out the role the designer should play within an organization, as part of a team, as a freelancer, and even as an entrepreneur. The problem I've encountered with clients is the perception of design. They perceive design as its end result, which is aesthetics, feelings, a sense of ease while savoring a well designed experience or interaction. I use the word experience very loosely, and as an umbrella term for products, services, systems of people, corporations, etc. Design is a problem solving process that encompasses two major parts. The first is researching and framing a problem, the second is prototyping and iterating a solution. Transitioning from the first to the second part requires synthesis and analysis on the subject being studied. Since I'm receiving a master's degree, people tell me I'm supposed to be an expert in something. I'd argue that I'm an expert in a process as opposed to being an expert in a specific field. This process is sometimes called design thinking, and other times people call it human centered design or fourth order design. It leverages anthropology, psychology, and sociology to make sense of the human experience in order to research and frame a problem. For prototyping and iterating solutions, we leverage digital and physical tools: borrow processes from engineering and graphic and product design, to business modeling and service design. 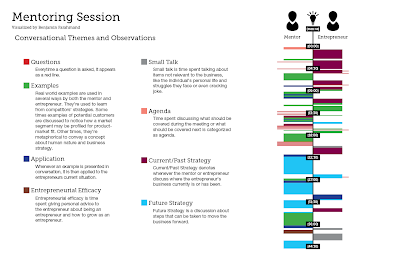 I've been having difficulty figuring out a role for myself within an organization and how I should present myself because every job opportunity I've had thus far has been from word of mouth, meeting and talking, and occasionally brainstorming to show some of these design thinking tools in action. More to come as I spend time thinking about my role as a designer within an organization, and my role in our current society and as an entrepreneur. About two weeks ago I had a meeting with Richard Genzer. He recommended I transform the mentoring timelines into pie graphs and correlate them to the post-mentoring session follow-up I've been doing with the entrepreneurs. Once I've collected data, this type of correlation could allow me to come up with a theoretical breakdown of an optimal mentoring conversation. Also, by simplifying the data into pie graphs allows for quicker communication at a lower resolution, and will hopefully become easier to notice patterns. The following series of images shows the transformation of the timeline into a pie graph and a bar graph. The first image is a legend that gives a greater description of the various conversational themes. Re-reading my previous post about design research and how I described what it means for a human centered designer to frame a problem in the context of a community, I realized I needed to break down the different steps involved in framing a problem. Just as I did with my previous post, I'll use examples from my thesis to show the different steps, but this time I'll also reference several design texts. 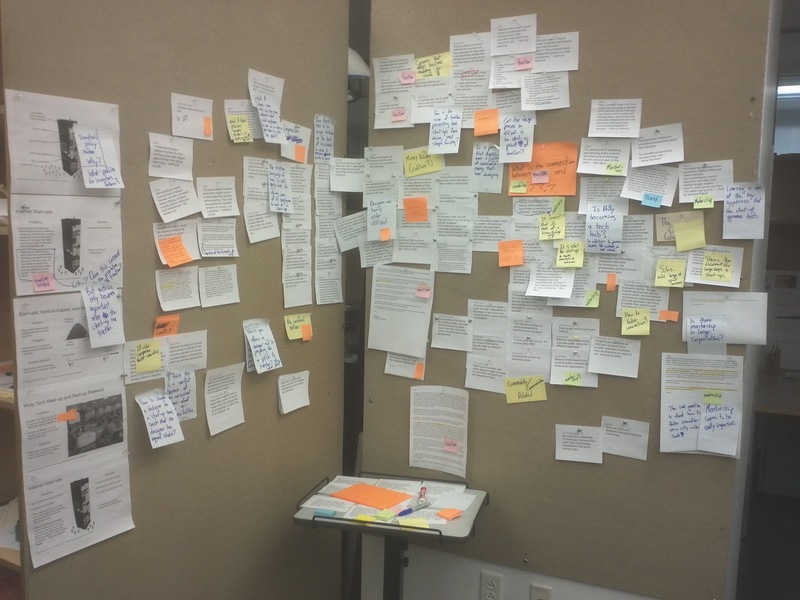 This will build up a language to describe design research and its role within the design process. A theme in design research is to understand the relationships between different problems. Understanding how problems are connected by using visual mapping techniques can greatly aid in sense-making and communication. Communicating the interconnectedness of each problem, challenge, and opportunity allows for a deeper level of research that will shed light on the root of the problems you're tackling. Designers call these types of problems, wicked problems, because there is no single, simple, or straightforward solution. Instead, the solution takes on the form of a system of solutions, which tackles a system of problems. Sometimes prototyping and testing each solution within a system is a start. However, each solution for each respective problem is not enough, because a solution by itself does not anticipate the difficulties of interacting with other solutions. Thus, a systemic perspective of the interaction of solutions is necessary. 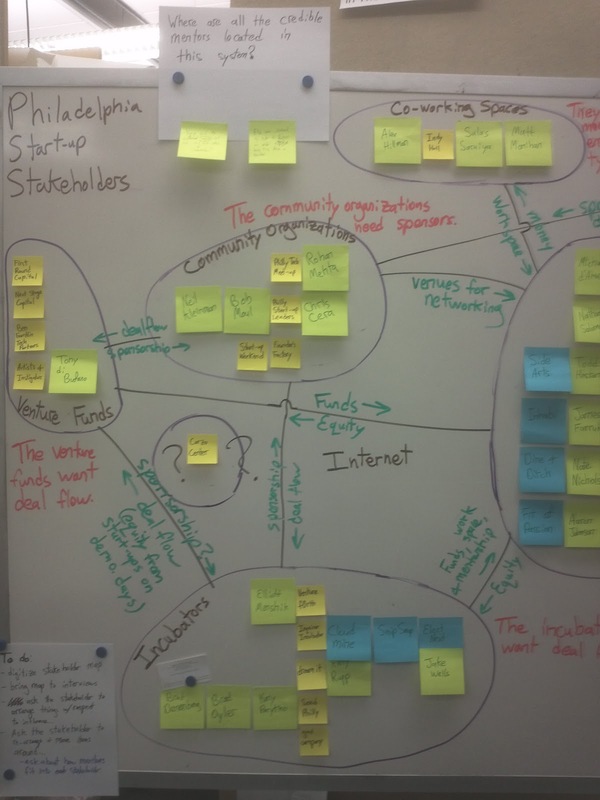 For example, after I finished my first round of interviews for my thesis, I became aware of three major challenges for the Philadelphia startup ecosystem. 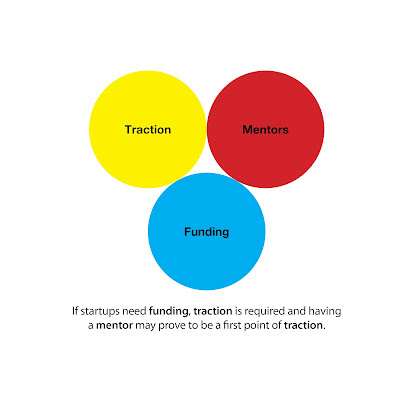 These three major areas included a disconnect between mentors and entrepreneurs, a lack of funding in the Philadelphia startup ecosystem, and the entrepreneur's concern with traction. (1) "Hands-on help from investors have little or no effect on the company's operational performance. But the right mentors significantly influence a company's performance and ability to raise money." (2) "Founders that learn are more successful. Startups that have helpful mentors, track performance metrics effectively, and learn from startup thoughts leaders raise 7x more money and have 3.5x better user growth." These two key pieces of information pointed towards mentoring as a vital opportunity, challenge, and problem that required some sort of solution. Solving mentoring would then indirectly solve traction and funding because of these relationships between traction, mentors, and funding. In his book, Exposing the Magic of Design, Jon Kolko presents three major steps: making meaning out of data, experience frameworking, and empathy and insight. Roger Martin, in The Design of Business, calls these same steps the knowledge funnel, when you're going from a mystery to a heuristic to an algorithm. These are all about discovering problems and solutions, and the important part of finding the problem is correctly understanding the relationships between different problems. If you take a look at the example I provided above from my thesis, the example shows the organization of data points into a heuristic, as Martin would call it, and making meaning out of data, from Kolko's perspective. Making meaning out of data is the step you take when you've already completed a round of data collection and are working to find themes and structure to interpret the collected data. Giving form to the data and finding patterns is messy! Organizing and re-organizing the data reveals structures and relationships between groups of data. From the previous example about traction, funding, and mentoring, getting to that finalized, clean, and communicable state takes time and requires an open space outside of your laptop. Kolko describes the need for using the physical format over the digital as a way to permit easy manipulation of individual pieces of data. Otherwise, hording the various pieces of collected data in a digital format imposes a file and folder hierarchy that may prevent insights to be gained. More examples and thoughts about the design process to come in part 3 of this series. To read the current draft of my thesis, go here. A great discussion about social entrepreneurship between Fred Wilson, Jacqueline Novogratz, Roger Ehrenberg, Jacob Grey, and facilitated by Scott Edward Anderson. They delve into why VCs invest in social entrepreneurs, the role social entrepreneurship plays in our society, and the motivations of a social entrepreneur. Discussion was hosted by GoodCompany Group. Interesting talk between Rodney Brooks, John Markoff, and Andrew McAfee about robots taking people's jobs and the role of robots in society and economy. I met with Garrett Melby a few weeks ago to receive feedback on the third iteration of the mentoring system. Some of the crucial pieces of information that I needed to better understand includes the business readiness intake, how mentors would sign-up for the service, how mentors and entrepreneurs would follow-up once they had an advising session, and how best to communicate the entrepreneurs request for mentoring. 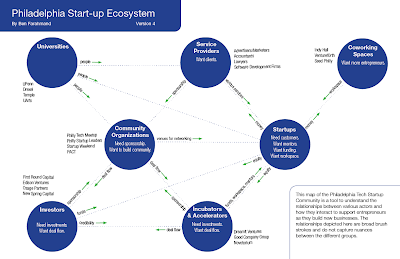 The diagram below shows the next iteration of the mentoring network with feedback incorporated into it, and I've also been wrestling with a possible logo, brand, and mission statement for this thesis project. The current name is talKIN (it's a play on 'kin' referring to community). The mission statement is a conversation focused mentoring and advising community for entrepreneurs. The rest of this blog post will cover the different areas I received feedback on and various other details that have shed insight into better designing a mentoring network. The business readiness intake is a two step process. First, the entrepreneurs from the original candidate group funnel themselves into idea stage, launch stage or operating business. This first part of the business readiness intake also asks for the elevator pitch and contact information. The second part of the filter has two components. The first component takes the idea and launch stage entrepreneurs and has them meet with an early stage strategist. The purpose of meeting with an early stage strategist is to help the idea and launch stage entrepreneur discover their problem areas, understand where to they need to focus, and where they need the most help. The second component takes the operating business and has it self-diagnose where its problem areas. The reason the idea and launch stage entrepreneurs meet with an early stage strategist is because entrepreneurs at this stage, do not yet know how best to focus their efforts or even the order of actionable steps to start a business. When mentors from the different local mentoring organizations sign-up for this service, they choose based upon a sliding scale, their expertise and interests. Some of these areas include business development, customer development, finance, fundraising, legal, marketing, operations, product development, sales, and team. The mentor also chooses the industries they've worked in, provides their schedule, and how long they would like to have a mentoring session. Finally, the mentor chooses whether they would like to meet early stage, launch stage, and/or operating businesses. Communicating to the various mentors on the network about the entrepreneur's problem areas is a delicate matter. To prevent mentors and advisers from fishing and to make sure that the entrepreneur feels safe about communicating the problems they're experiencing, the request for mentoring becomes a request review. The request review is less detailed and only presents the different areas the entrepreneur needs help without describing the problem the entrepreneur is experiencing. The request review is then sent out to mentors that match based upon industry, schedule, meeting duration, expertise, idea stage, launch stage, or operating business. Once a mentor agrees to meet, the mentor receives an email with a greater description of the problems the entrepreneur is having. Another detail is that a mentor can see whether another mentor has already agreed to meet, so they don't double book a session with the entrepreneur. This will prevent a waste of resources. After the mentoring session comes follow-up. At this time, we ask the entrepreneur to give feedback on whether they found the conversation useful based upon the ideas discussed with the entrepreneur. For example, we would the entrepreneur whether they conversation moved him or her to action, or whether the ideas seem like good ideas when they acted on them. Furthermore, it seems vital that feedback is incorporated from both the entrepreneur and mentor about each other, but figuring out whether these will be positive or negative screens has not yet been determined. Maria Konnikova gives a great talk about decision making; and the process covers curiosity, self-reflection, mindfulness, creativity, logic and perception. These are some books and articles I've found to be useful in figuring out what design used to be, where design is going, and how ideas from other fields are mingling with design. If you have any questions, feel free to ask. Just came across GoodCompany Group's summer lecture series on Vimeo. GoodCompany Group is an incubator and accelerator located in Philadelphia focused on social entrepreneurship. They seem to have valuable insight for social entrepreneurs on various topics like revenue and margin model, market analysis, go to market strategy, sales strategy, team building, and capital strategies. Enjoy! Philly Startup Leaders has developed a map showing the locations of many startups, various companies, accelerators, coworking spaces, investors, and a variety of services. It's the most comprehensive map I've ever come across, and having a map like this when I first started my thesis would have been a great aid. 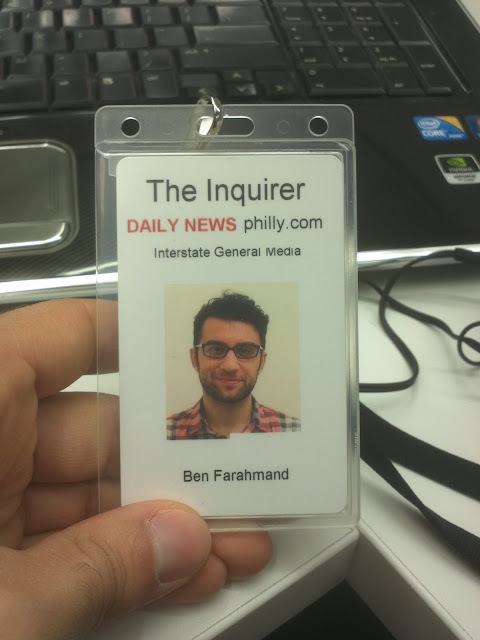 It would have sped up the interviewing process of finding entrepreneurs across Philadelphia. To find entrepreneurs, I to attend the different organizations like Philly Tech Meetup, Philly Startup Leaders, Philly Startup Weekend, Founder Factory, and various other events where entrepreneurs gather in order to tell them about my thesis and find prospective interviewees. Having trekked across Philadelphia to find and interview people within the startup ecosystem, I mapped out and discovered relationships. 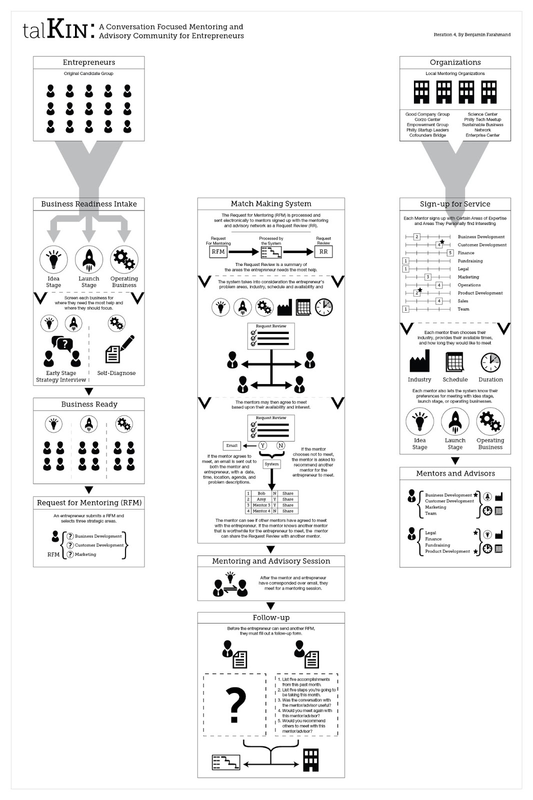 Though it's not even close to being as comprehensive as the map above, it sheds light on the relationships between the different types of organizations and how they influence and sustain each other. This is the first post in a series of posts I'll be writing about human centered design. I see these posts as a way to help me think about and verbalize what I do by practicing and getting feedback on these essays. I've been involved in the field of human centered design for the past two and a half years. It's a field that has at its core a meta-level of analysis and synthesis on the design process. A process that many say started at IDEO, and it's a problem solving technique that has greatly shown its impact in Silicon Valley. But there a other design firms, like frog design, which also demonstrate a similar design philosophy. The design research process is about creating new wisdom for the purpose of designing tools that solve problems people face as they go about their lives and perform their jobs. I think the most important part of the design research process is to figure out how to frame the problem, because in the end, the solution will closely follow the description of the problem. Looking at design at this high level, there are three parts, framing the problem, prototyping a solution, and oscillating between the two states of framing the problem and prototyping a solution. I've come to understand design research as a way to learn about the world and make sense of the human experience by fashioning and fabricating tools that can probe and structure the information observed about the world. I'll use examples from my thesis to demonstrate and illuminate design research in practice. One place a human centered designer can start is by performing ethnographic research. This can take the form of interviews, surveys, shadowing, role-playing, etc. One application of ethnographic research is to understand a community, a person, a market, an organization, corporation, etc. This type of research will reveal the community's culture, how the different individuals comprising the culture function autonomously and interactively. This process eventually reveals a problem or opportunity that can be addressed via design. For example, I engaged with and ethnographically researched the Philadelphia technology startup community for my thesis. I began by doing interviews, which then led to discoveries of challenges and opportunities the community faces. There were two rounds of interviews for my thesis, the first was my initial probe into discovering what the community's problems, challenges, and opportunities. The three major themes discovered revolved around a lack of funding in the Philadelphia region, the need for mentors and advisers who have been entrepreneurs, and each startup's need to figure out how to gain initial traction. The second round of interviews leveraged the knowledge I had gained from the first round of interviews, and I designed a research tool to reveal the community's perspective on resource dispersion. To move my thesis forward, I had to discover where mentors and advisers were located and how they were dispersed throughout the community. Being able to visually map data that's collected in this manner has played a key role in making new connections between information that's normally not connected. Another example is observing startups operate and function in their natural environment in order to observe the entrepreneurial culture specific to Philadelphia. To do this, I attended and observed multiple Philly Startup Weekends, observed the Philly Tech Meetup and PSL's Founder Factory, and had the opportunity to help and observe the various startups at the 2012 GoodCompany Ventures program. Doing this aided in understanding that mentors/advisers and entrepreneurs can serrendipitiously meet or have planned meetings; eventually, realizing how mentors and advisers may serendipitously interact with entrepreneurs and how mentors and advisers trust and identify each other. At this step in the process, I was finally able to frame the problem for my thesis and I could begin prototyping different solutions (Request for Mentoring, Mentoring Progress Report, and Mentoring System). Also, at this point in my thesis, my thesis began oscillating between prototyping solutions and reframing the problem as I continued to learn from the prototypes I tested. The next phase of research for my thesis was understanding what goes on during a mentoring/advising session and what goes on before and after the mentor/adviser and entrepreneur meet face-to-face, which eventually will lead to a mentoring system that will benefit entrepreneurs, mentors/advisers, and the organizations that provide mentoring/advising. You can explore the current draft of my thesis here. Read the next post in this series here. Two more mentoring sessions recorded, analyzed, and visualized! 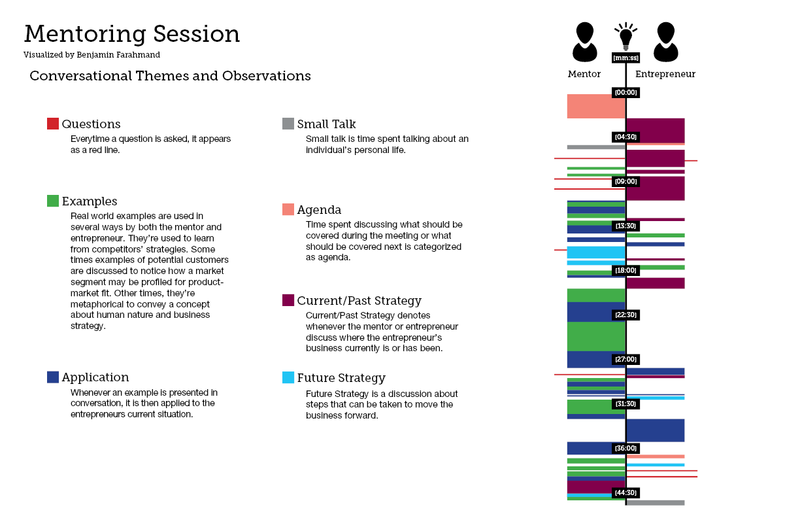 The first infographic is a conversation between an idea stage entrepreneur and a mentor. It's also a first time meeting between this particular mentor and entrepreneur. 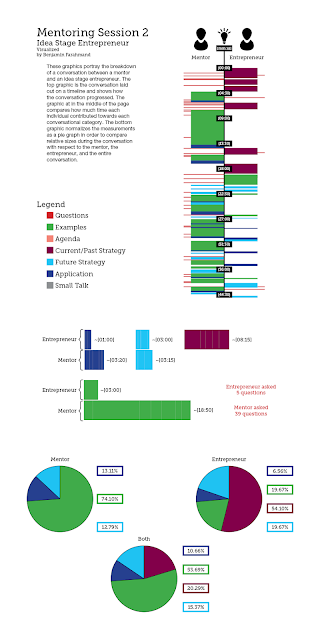 The second infographic is a conversation between an entrepreneur that's built a prototype and a mentor. The entrepreneur and mentor depicted conversing in the second infographic have been meeting for several months now and have an established relationship. 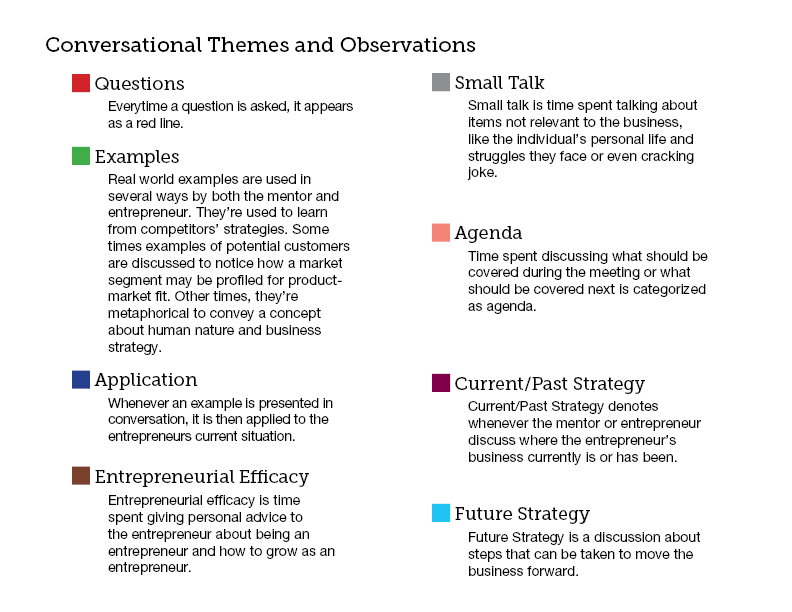 When comparing these two conversations with the first mentoring conversation I visualized, which was a first time meeting between an idea stage entrepreneur and mentor, the similarities are mostly in how the conversations begin. The entrepreneur has to bring the mentor up to speed about what he or she has been doing for the past month or so before the mentor can provide any strategic advice. This part of the conversation is highlighted in burgundy. Furthermore, another similarity is the total amount of time taken up by current/past strategy. It takes a significant portion of the mentoring session to bring the mentor up to speed on what the entrepreneur has been doing and is currently doing. I do not yet know if it's good or bad that it takes somewhere between 10 - 15 minutes to discuss current/past strategies. One noticeable difference between these two mentoring sessions and the first mentoring session is the amount of questions asked by the mentor from the first mentoring conversation. 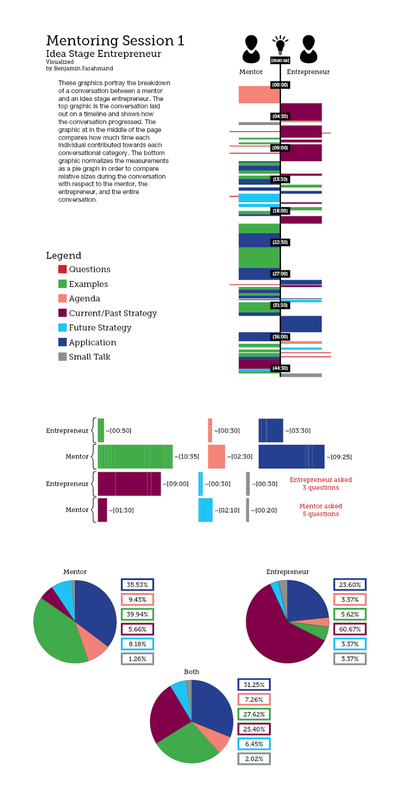 I think the difference in the amount of questions asked has to do with the mentoring/advising style of the mentor. The part I'm still struggling to figure out is how to measure an effective mentoring/advising conversation. Looking at the infographics, I'm not yet sure I can see or point to markers that comprise an effective mentoring conversation. You can see one possible prototype here, or another prototype here. Great news! TuvaLabs is now part of the third class of the Project Liberty Incubator. 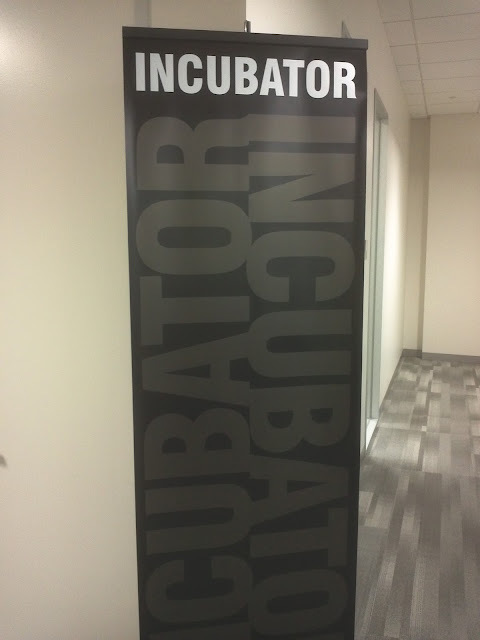 The incubator has brought together several different organizations including The Knight Foundation, Interstate General Media, Ben Franklin Tech Partners, Drexel University, and Dreamit Ventures. 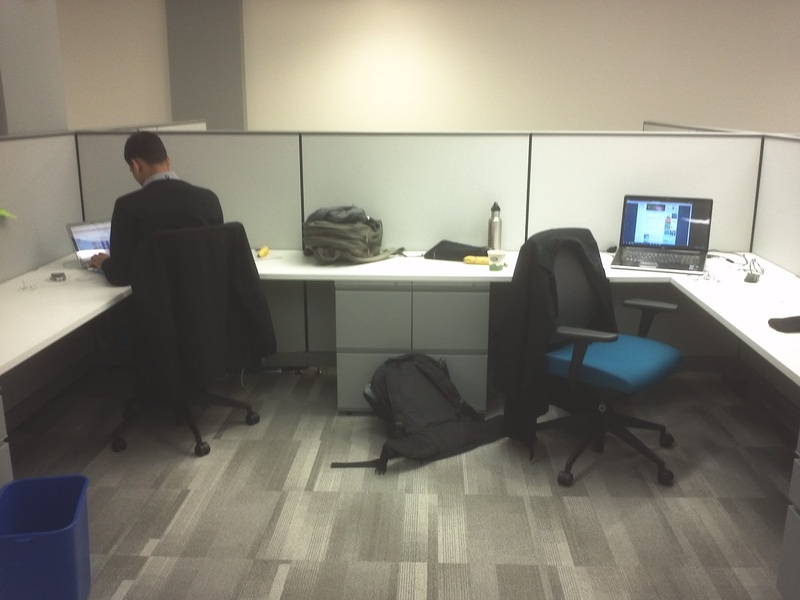 The incubator's work space is located on 8th and Market, right on the end of the Gallery at Market East. It's been about a week in this work environment, and I finally received my badge. The work space is a bit empty and needs a little love. Maybe I should bring Johnny Four and set him up on the desk?